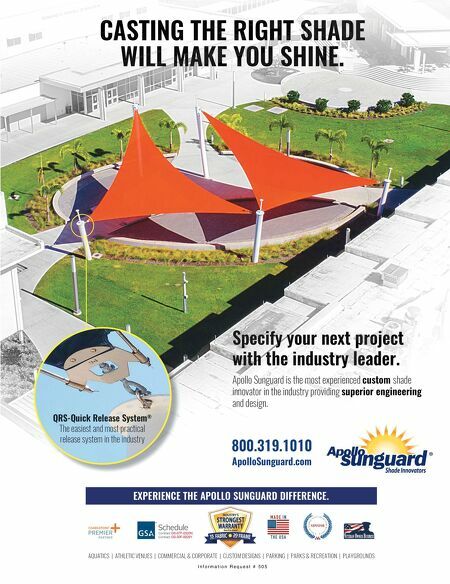 Continued on page 22 20 Landscape Architect and Specifier News Hogan Park is a beautiful new neighborhood park that almost didn't happen. If it weren't for a spark of inspiration realized through the community outreach program that yielded creative design ideas and a determination of Lawndale's civic leaders and city staff, this feat might never have happened. A new park with swings, play spaces, picnic areas and grass seemed well beyond the possibilities for the small parcel of open space available within Lawndale's east side neighborhoods. Note: Lawndale (pop. 32,769) is in the South Bay area of metropolitan Los Angeles. The goal of betterment of the community's image, greater opportunities for health and wellness and access to a broader range of recreational experiences came from the community. At an initial neighborhood meeting focused on improving a small city lot, many community participants advocated that a "real park" could be built if the adjacent street was closed. This brainstorming changed every aspect of the project. A firestorm of activity by civic leaders and city staff solidified the feasibility of a street closure on Osage Avenue. An extensive public outreach confirmed the neighborhood's backing for this large open space park. With the city short on funds, developmental costs for the project required seeking funding from several sources, including grants and special street funds. Once the project was awarded an Openspace and Parks District park improvement grant, the project was approved. 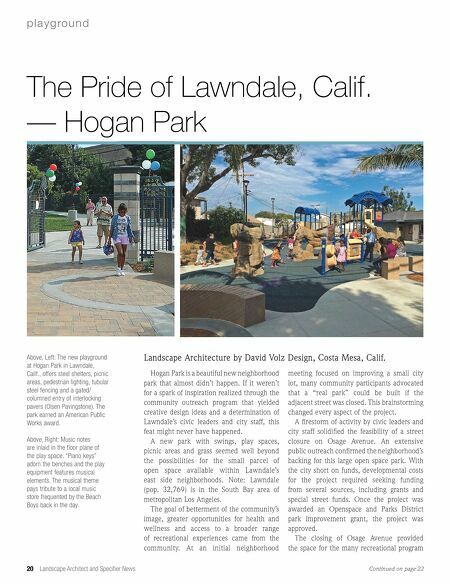 The closing of Osage Avenue provided the space for the many recreational program The Pride of Lawndale, Calif. — Hogan Park p l a y g ro u n d Landscape Architecture by David Volz Design, Costa Mesa, Calif. Above, Left: The new playground at Hogan Park in Lawndale, Calif., offers steel shelters, picnic areas, pedestrian lighting, tubular steel fencing and a gated/ columned entry of interlocking pavers (Olsen Pavingstone). The park earned an American Public Works award. Above, Right: Music notes are inlaid in the floor plane of the play space. "Piano keys" adorn the benches and the play equipment features musical elements. The musical theme pays tribute to a local music store frequented by the Beach Boys back in the day.